My name is Matt Winick from Ann Arbor, Michigan with a strong interest in learning history with social justice. In these subjects, I like to learn the need for Civil Rights to be stronger to reduce discrimination, protect the environment from pollution, have criminal justice reform to help protect people’s rights while reduce crime, and many others. 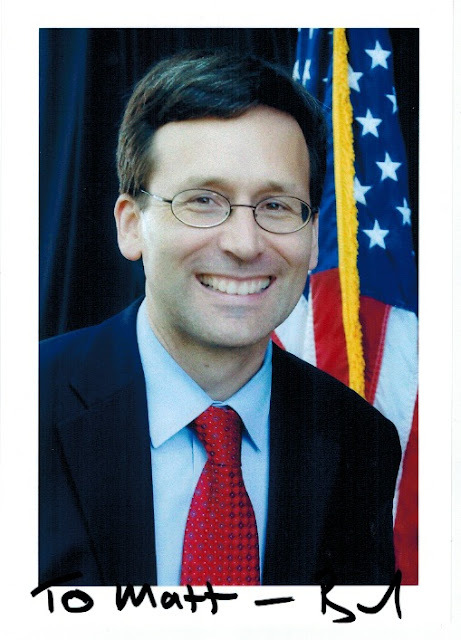 Attorney General Ferguson, the main reason I’m writing you a letter to explain how I find your work as 18th Attorney General of Washington to be very inspiring me. 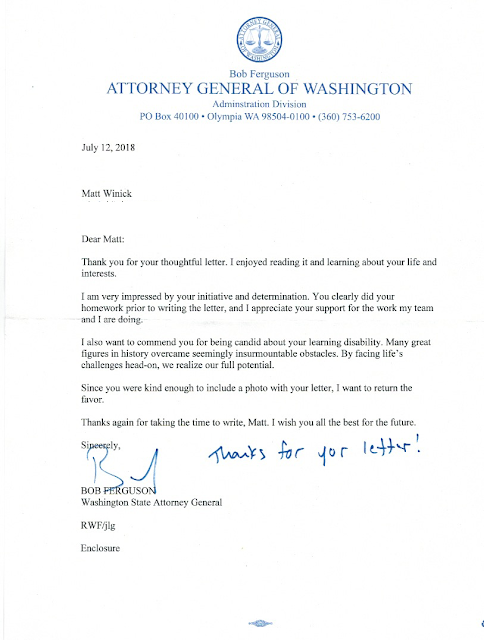 In your current role as 18th Attorney General of Washington, I truly appreciate on how you are a strong supporter of Civil Rights by advocating for people with disabilities’ rights, prosecuting people who commit hate-crime to help protect minorities including people who are different, and expressing the need to reduce racial profiling in the criminal justice system to help protect minorities including immigrants from being oppressed. Supporting drug treatment programs to help drug-users get the care they need to reduce drug-abuse, working to expand Office of Washington Attorney General office including law enforcement resources to help victims of crime or victims of domestic violence get help on their trauma, and advocating for the need for fund to improve DNA testing including forensic science to help reduce sending an innocent person to jail while solve evidence efficiently is common sense for criminal justice reform. Also I like on how you prosecute companies that polluted the environment or violated environmental protection laws to help protect the environment, launch investigations in public officials that are corrupt or accept illegal bribes to restore public trust in the government, and work to help protect women’s rights from being weakened. Another thing that I like about your work as Attorney General is how you stand up against bigotry and both political parties including the president-elect when they are not supporting our country values by convincing the federal not to challenge the legalizing of pot, be against the travel ban executive to combat against discrimination based on religion, advocate for the need for immigration reform to help protect immigrants including refugees from being oppressed, pushing for educational awareness to help teach people about the need to reduce bullying, and working hard to defend DACA children from being oppressed or deported without probable cause. Attorney General Ferguson, I have autism with a learning disability. Having a disability is hard for me because I have trouble comprehending on learning different advance subjects, sometimes I struggle to communicate my thoughts, and get teased. Also another thing that I struggle with a disability is when I see the president elect and both political parties and the new media use bigotry and aren’t supportive of people with disabilities’ rights. 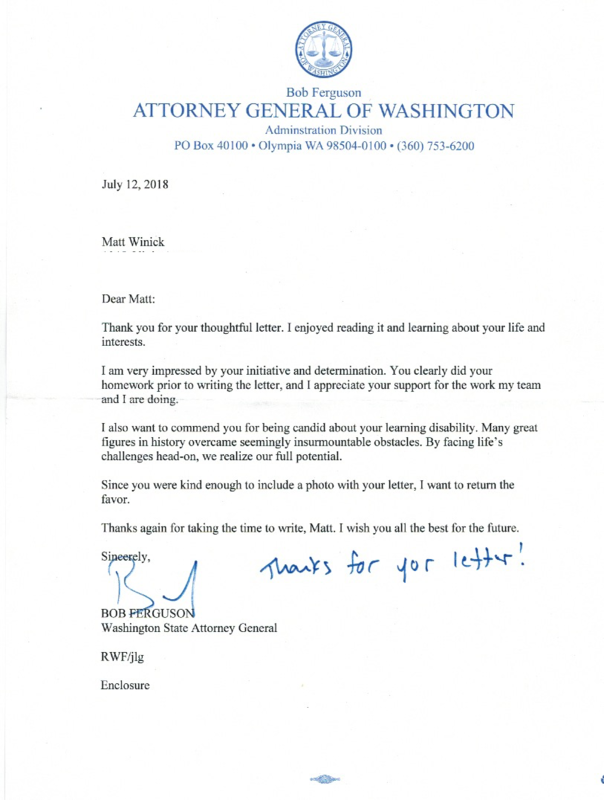 Your commitment to be a strong supporter of Civil Rights including people with disabilities’ rights and your commitment to combat against bigotry really inspires me to work hard on my disability. Also your role as Attorney General of Washington gives me motivation to continue to learn history with social justice. My future goal is to someday work in these areas to help emphasize the need to make Civil Rights stronger to reduce discrimination, protect the environment from pollution, and have criminal justice reform to help protect people’s rights while reduce crime. I strongly believe that you are making a great difference in your current role. I’m very proud on how you are working hard to support Civil Rights, protecting the environment, and pushing for criminal justice reform. Also I truly appreciate on how you are stepping up for people’s rights including people who are different when they face bigotry or hate from both political parties, news media, and even the president-elect. Even though I live in Ann Arbor, Michigan, I’m very grateful on how you inspire me to work hard on my disability and be motivated to continue to learn history with social justice. 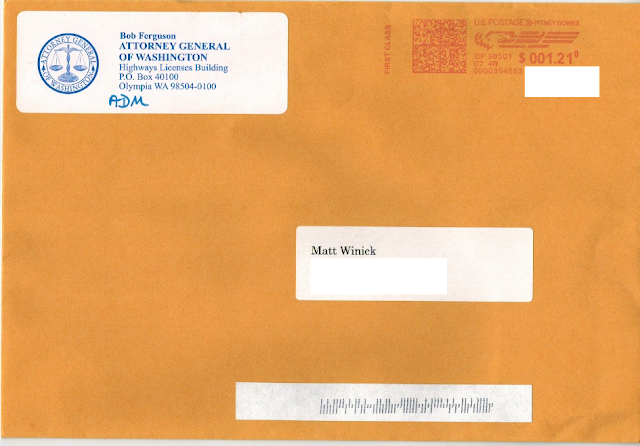 Thanks for taking the time to read my letter, working hard to make a great difference for society, and inspiring me. I wish you the best to continue to push and stand up for common sense ideas and for people who are different or come from different background.